As has been true in every war ever fought by the United States, thousands and thousands of non-citizens took on the uniform of this country in the First World War and served with distinction. Those who came here from Europe, from South America, from the far reaches of the globe often became citizens, their path to citizenship often smoother because of their military service. And their children — born here — were automatically citizens. And they served as examples for their countrymen. But that wasn’t true for one group. One group of soldiers couldn’t become citizenship ambassadors for their countrymen. Their countrymen couldn’t become citizens, and their children — even if born in the United States — weren’t citizens either. Even though they were native Americans. Or, to be precise, because they were Native Americans. It wasn’t until 90 years ago yesterday — the 2nd of June 1924 — that every Native American was recognized as a citizen of the United States. 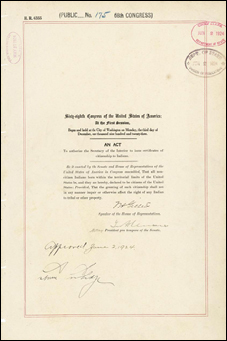 Before the law passed, roughly two-thirds of Native Americans had become citizens through other laws, including treaties, such as the 1867 Treaty with the Senecas and Shawnees and other tribes;3 specific statutes such as the act of 1921, giving citizenship to all Osage tribe members,4 and various allotment acts. Now you might think that, with an act giving citizenship to all Native Americans and the Fifteenth Amendment guaranteeing the “right of citizens of the United States to vote,” all Native Americans would have been able to vote in 1924. Ironically, both cases were brought by Native Americans who had fought for the United States in World War II … and had been unable to vote after they returned home. Many years ago as a young and beginning teacher, I was preparing lesson plans and was researching my topic, and it dawned on me like a flash that the cowboys were the bad guys and the “indians” the good guys!! Was as enlightening — and shocking — as learning about Santa Claus.